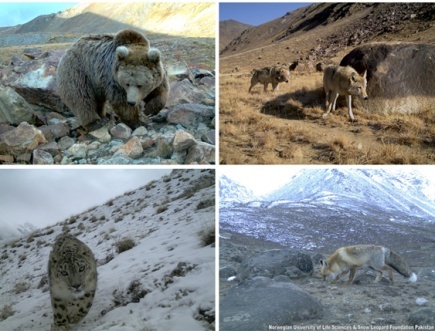 Scientists studying wild carnivores, including the endangered snow leopard, in the high mountains of northern Pakistan are using automated wildlife cameras to answer ecological questions. – Camera traps are a non-invasive solution to a common problem in wildlife monitoring: finding out who is where and when, says Richard Bischof, a researcher at the Norwegian University of Life Sciences and leader of a new study published in the journal Methods in Ecology and Evolution: Using time-to-event analysis to complement hierarchical methods when assessing determinants of photographic detectability during camera trapping. – In most wildlife surveys even animals that are present in an area may not be detected, and with this study we explored how various factors influence the probability of photographic detection. Although several other species were photo-captured during the study, the article focused on three predators, the snow leopard, the red fox, and the stone marten. 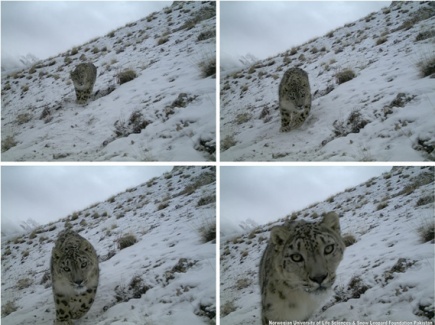 Camera traps are often set for weeks or months, and the study showed, among other findings, that it can take up to 5 times longer to photo-capture the elusive snow leopard than the red fox, even if both species are present in an area. The probability of detecting a carnivore can be improved substantially by appropriate site selection and the use of scent lures, which draw inquisitive carnivores to a camera trap station. – Studies such as this are important not only in terms of the knowledge they yield about wild carnivores and the methods used to study them. They are also an opportunity to build the capacity of Pakistani wildlife professionals in the highly technical and continuously developing fields of ecology and conservation. The study was funded by the Research Council of Norway and is part of a larger project involving several international partners studying the ecology of carnivore guilds. The main objective in the published article is wildlife monitoring, with camera traps as a non-invasive tool. This method can be used to extract all kinds of information, including species distribution, occupancy (presence/absence), abundance and density, activity patterns, etc. But the project is targeting both the development of non-invasive monitoring methods (methodological component) and the extraction of ecological information (ecological component). This first article was concerned with the process of detection when camera trapping carnivores, i.e. – We looked at patterns in the probability of photo-capturing a species, if it was present in an area. We will now also begin to extract ecological information, but those results will be reported later, says Richard Bischof.